Scarf reference Adam with stripes. Material : 100% carded cotton, in jersey. Color : Ecru/Navy, Navy/Ecru. Length : 1 m. Width : 16,5 cm Size : Child. Scarf refernce Scarf in plain color or with stripes. Material : 100% wool, in 1X1 rib. Color : Navy, Medoc, Navy blue, Black, Ecru/Navy, Navy/Ecru. Length : 1.30 m. Width : 17 cm Size : Child. Choose a scarf and bonnet set with the Quart item. Sailor’s cap reference Quart in solid color or with stripes. This item has a setback. Material : 100% wool, in 1X1 rib. Color : Navy, Ecru/Navy, Navy/Ecru. Size : Child. Choose a scarf and bonnet set with Scarf. Sailor’s cap reference Cartier in plain color or with stripes. This item has a setback. Material : 50% wool and 50% acrylic, in 1X1 rib. Color : Navy, Navy blue, Tulip, White/Navy blue, Navy blue/White, Navy blue/Tulip. Size : Child. Choose a scarf and bonnet set with the Duguay item. 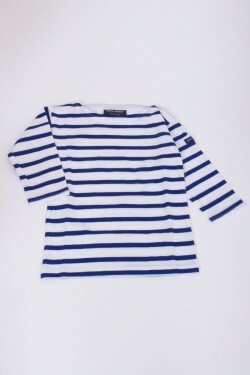 Cap reference Surcouf with stripes. This item has a setback. Material : 96% cotton and 4% elastane, in jersey. Color : Ecru/Navy, Navy/Ecru. Size : Child. Scarf reference Duguay in solid color or with stripes. Material : 50% wool and 50% acrylic, in 1X1 rib. Color : Navy blue, Tulip, White/Navy blue, Navy blue/White, Navy blue/Tulip. Length : 1.30 m. Width : 17 cm Size : Child. Choose a scarf and hat set with the Cartier item. Sailor’s cap reference Cartier Layette in plain color or with stripes. This item has a setback. Material : 50% wool and 50% acrylic, in 1X1 rib. Color : White/Navy blue, Navy blue/White. Size : Layette. Choose a scarf and bonnet set with the Duguay Layette item.